Contents: Species, Distribution, Diet, Nesting Behavior, Nestboxes, Nestbox Location, Monitoring, Nesting Timetable, Longevity, More Info. Also see more Tufted Titmouse nest and egg photos, Titmouse Nestcam Info and Blog. Species: This common backyard bird is not all that common in nestboxes. AC Bent, author of the wonderful Life Histories of Familiar North American Birds, never even found one of their nests. Out of 55 boxes on my trail, I only get one titmouse nesting each year. According to Birds of North America online, for a while the (Northern) Tufted Titmouse (Baeolophus bicolor) or TUTI included the Black-crested (Mexican) Titmouse (P. b. atricristatus), but now it is back to two species (TUTI and BCTI.) They do interbreed. The Northern Titmouse is gray, lighter on the breast and belly, with a gray crest and black forehead. 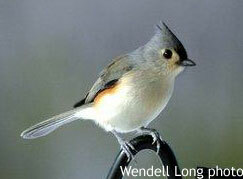 The Black-crested Titmouse (found in Texas and Mexico) has a black crest and a white forehead. Flanks have rusty wash. Both have prominent black eyes. The sexes look alike. Juvenile Tufted Titmice have less black on their head. Bridled Titmouse: Baeolophus wollweberi. Stripey face, black throat and really raised crest. Juniper Titmouse: Baeolophus ridgwayi. Looks like the Oak Titmouse but has a different range. Oak (Plain) Titmouse: Baeolophus inornatus. Smaller and generally more drab, with no rusty flanks. The scientific name for the Tufted Titmouse used to be Parus bicolor. AC Bent referred to it as a "tomtit." Previously, they had called the TUTI the Eastern Tufted Titmouse or ETTI, but that name is no longer in use. Diet: Insects and other animal matter (caterpillars, cotton-boll weevil, ants, wasps, bees, flies, spiders and snails, etc. ), seeds (especially large sunflower seeds), fruit (e.g., blueberry, blackberry, mulberry, elderberry, huckleberry, bayberry, Virginia creeper, fox grape, wild cherry, serviceberry and hackberry), and mast (acorns, beech nuts, pine seeds etc.). Titmice hoard food in fall and winter. They enjoy suet and mealworms. 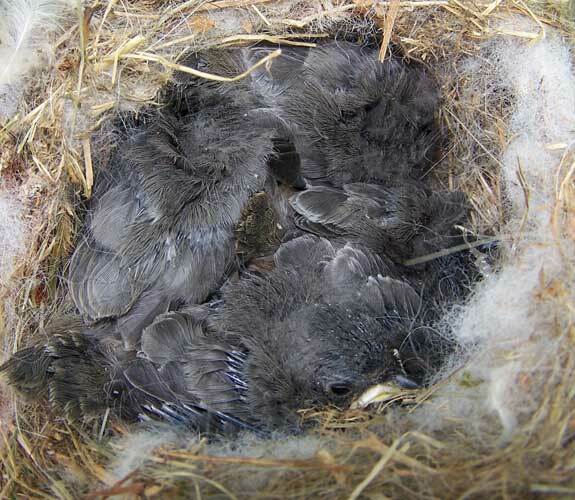 Nestboxes: Tufted Titmice typically nest in natural cavities (e.g. rotted trees, fence posts) or holes excavated by other creatures (downy, hairy, red-bellied, red-headed, and pileated woodpeckers or squirrels). They are not particular about the tree species. Cavities they use typically measure 8.6-11 inches deep, with 1.8-2.2 inch entrance holes. Titmice do not frequently use nestboxes on a bluebird trail. Perhaps this is because bluebird boxes are often mounted at a height of about 5 feet (for the convenience of the monitor) in open areas, or perhaps they just prefer snags. Keith Kridler of TX has had them nest in many styles of nestboxes with different depths and floor sizes. I find they prefer a higher box (6-12 feet), hanging boxes, and the Zuern (Tree branch) box. In my experience, they may also prefer a box with a larger interior. I have seen them go into my PUMA trap box, and they tried to nest one year in a large square open compartment in our RV even though there were plenty of NABS-style, pole mounted nestboxes around. The nestboxes on my trail that have been used by Tufted Titmice all had a 1.5" hole, and other monitors report the same. Most sources say nestboxes for titmice should have an entrance hole at least 1 1/8 to 1 1/4" wide, up to 1 3/8". I do not know which size is ideal. 1 1/8" seems too small, as Titmice are bigger than Chickadees, and Tufted Titmice are significantly larger than Oak/Juniper Titmice. However, Donna Ulloa had a nest with eggs in a box that had a 1 1/8" restrictor on it. They may prefer a box that is hanging, or mounted up high. They may like hanging boxes better than bluebirds do. When nesting in natural cavities, they select ones that are 3 - 92 feet above the ground; 36-39 feet on average. Keith Kridler of TX found they preferred a box mounted 8-14 feet over the ground vs. 4-6 feet. Other sources say 6-15 feet. They have nested in standard NABS, Chalet and Peterson boxes that are about 5 feet off the ground, and a Purple Martin house 15 feet high. Gary Springer believes that Tufted Titmice strongly prefer nestboxes mounted 8.5 feet high. A side-opening box may be better since some females panic when the box is opened for monitoring. Titmice will use human hair in nests, so you might go to the barber/hair dressers and ask for some floor sweepings (short chunks only - long hair can get tangled around babies legs) and put it in a suet basket or around your garden. They may like a spot near food sources like bird feeders. They do not like to cross open spaces, so they may also prefer boxes under heavy tree canopy. They may prefer boxes mounted on trees, which poses a risk of predation. They WILL nest on boxes on baffled poles and boxes that hang from trees. They will nest near a house (reported 15-20 feet away). Although they supposedly have breeding territories of 2-5 acres or more, Titmouse boxes can be placed 30-40 feet apart. Horace Sher reported three pairs nesting on a quarter acre lot. They have nested in a box 5 feet away from a chickadee nest. Donna U. has two pairs nesting about 120 feet apart, separated by a building so they cannot see each other. 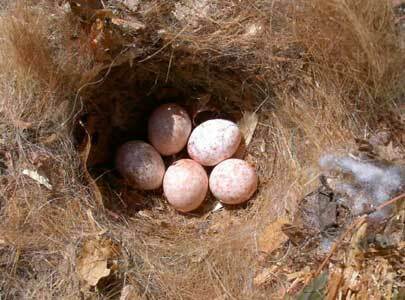 Titmouse nests are often lost to House Wrens and Flying Squirrels, due to overlapping habitat. Although they are inquisitive, Titmice tend to be less tolerant of monitoring and manipulation than bluebirds are. (Of course individuals vary - some are more tolerant of activity). They are more likely to abandon a nest if disturbed, especially before young have hatched. However, I usually monitor their nestboxes (quickly and quietly) weekly after egg laying. I had a titmouse start a nest in an RV plug compartment. I moved the nesting material into a nestbox right in front of the compartment, at the same height. Although they did check it out (I could tell, as I put a twig lying on the the entrance hole and it was moved a few times) they did not use it. Maybe if I had waited until they laid eggs.... I did install a nestbox cam in another box that had a titmouse actively incubating, and she returned to the box within 6 minutes and settled right in and laid additional eggs, but unfortunately the nest was abandoned later. Do not put a hole restrictor on a nestbox until an egg is laid - to be on the safe side, wait till incubation begins. Some females sit docilely on the nest or flush. Others hiss like a snake and rapidly and repeatedly strike the side of the box when it is approached or opened (see video clip). The first time this happens, be prepared to change your underwear. To prevent premature fledging, avoid opening the box after the nestlings are 11 days old. Excavation: Titmice are secondary cavity nesters, meaning they rely on natural cavities, cavities created by others, or nestboxes. Nest construction: (depending on location) begins late February through April. Construction of the often voluminous nest takes an average of 4 days, but can take up to 6-11 days. They may start bringing odd bits of leaves or trash in a month before nest construction actually begins ("claim leaves?") Coarser materials such as damp leaves (sometimes balled up or shredded), green moss, dried grass, and strips of bark make up the foundation. The nest cup is lined with insulating material like down, wool, hair, fibers, cotton or fur. They have been seen yanking fur out of live (and dead) mammals and the arms and heads of humans. Hair in various nests has been identified as that of raccoon, opossum, dog, fox squirrel, red squirrel, rabbit, horse, cow, cat, mouse, woodchuck, and humans (Pielou 1957). Rags, string or cloth, feathers and/or a bit of snakeskin may also be used. Like chickadees, they will use fur offered in a suet cage. She often continues to add nesting material (e.g., fur) during incubation and brooding. Until the eggs are laid, it is hard to distinguish the nest from that of a chickadee, although they typically use more leaves. The female tucks them into the cup. She may roost in the partially finished nest before egg laying begins. See dimensions. Egg laying: 3-9 eggs (5-6 most common), one each day, usually between 5 and 6 a.m. before leaving the nest for the first time in the morning. May skip a day in egg laying? Before incubation begins, the female spends the night in the nest cavity, perching on the rim. Eggs are smooth and non-glossy, small (but larger than a house wren egg), white to creamy white, with fine chestnut red, hazel, purplish red, brown, purple or lilac speckles or spots which are evenly distributed, with some concentration at the larger end. More white space than chickadee eggs. The female may or may not cover partial clutches with a "blanket" of nesting material when she leaves the nest, possibly to hide them from predators and keep them warm. Unlike chickadees, there is no evidence of egg dumping by Titmice. Incubation: 12 to 14 days, 13 days most common, beginning when the next-to-last egg is laid, and ending when they begin to hatch. Only the female incubates, spending about 70-78% of her time on the nest. Hatching: Eggs hatch within 10-18 or 24 hours of each other. Eggshells are removed. 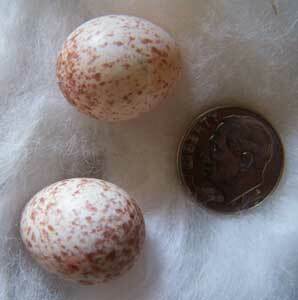 Since the last egg is incubated one day less than the rest, it often does not hatch, or may hatch into a runt. Development: The female broods newly hatched nestlings for the first few days. The hatchlings are almost entirely naked (with some tufts of natal down), salmon pink with closed eyes, and a big mouth and big abdomen. Eyes partially open on day 4. Eyes are fully open on day 8. All down is replaced by day 8–10. By day 10, the body is well-feathered. The female does not brood after day 12. By day 14, the young are entirely covered by feathers and resemble adults, although they have shorter primaries and rectrices, and retain the yellow rictus of the mouth. Fledging: 16-17 days (sometimes 15, maximum recorded 18). They may fledge at any time of day. It does not appear that adults typically entice the young to leave the nest (which is clean after fledging), although they may. Unlike bluebirds, they may all leave the nest quickly, one after another. (However one may lag since incubation begins on the next to last egg.) Fledglings are feeding themselves by 6 weeks of age. Dispersal: Young TUTI often stay with their parents during the winter and then disperse later in their second year. Some yearling titmice may stay on and help their parents raise a brood the following year. Number of broods: Tend to have one brood per year in their northern range, two in other areas. Nest site fidelity: AC Bent indicated that titmice will use the same cavity for years if not disturbed. Another study did not find titmice re-using cavities. Adult longevity: The oldest recorded Tufted Titmouse was 13 years and 3 months (Clapp et al. 1983). The average life span is probably about 2.1 years (Elder 1985). Winter: In very cold weather, TUTI roost inside holes and other cavities. During winter they will forage in flocks with other bird species like Downy Woodpeckers, White-breasted Nuthatches, and Carolina Chickadees. The Titmouse Story - 9 minute color video from nestcam footage, from house hunting to fledging. Super. Tufted Titmouse (Wild Bird Guides) by Thomas C. Grubb, Jr. Note: In one study, breeding cavities were 8.3 to 10.8 inches deep, and the distance from the rim of the nest to the bottom of the nest cup varied from 5.4 to 7.9 inches (Pielou 1957). The outside diameter of the nest stub or trunk varied between 3.9 to 4.9 inches, diameter of the cavity about 2.9 inches. The eggs were laid in a depression of about 1.5 inches; distance from the top of the nest to the cavity entrance 3.3 inches, on average. The diameter of the entrance was 1.7 to 2.2 inches. On a branch of a tree a few feet from the ground sat a Woodchuck (Marmota monax), while bobbing up and down above it a Tufted Titmouse was engaged in plucking hair from its back. - Ward Reed, 1927, in Life Histories of Familiar North American Birds.